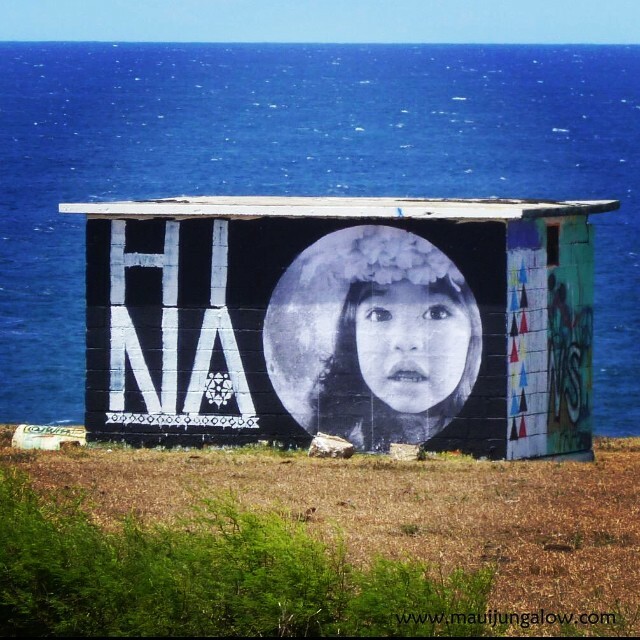 One of my favorite murals or street art pieces at the Hookipa pillbox. So beautiful, and eventually it was painted over. The word Hina is Hawaiian for moon. It sounds like "Hee-nah." It reminds me of how Zen monks create a tapestry of colored sand, and then they rake it over when it's done! It's beautiful and fleeting. I'm so glad to have a photo of this. The artists were: Alaula Artates and Wailani Artates. Mahalo! Hau oli la hanau Grambo. This means Happy Birthday in Hawaiian. The proper spelling with the Hawaiian diacritical marks is Hau'oli lā hānau. How to say it? Hmmm... you could try saying, "how oh-lee la hah now" and it would be close. I often don't use diacritical marks because they make it more difficult and sometimes I use this and don't, so I am sadly inconsistent with my use of them. There are many happy birthday murals, signs or street art painted on this pillbox, but this is one of the few in Hawaiian. Pic was taken 6/13/12. Another Happy Birthday sign, to Justin, who is 16. This photo was taken 4/9/13.